Abstract The purpose of this study was plotting changes in the level of taxation of enterprises operating in the food marketing chain. Particular attention was paid to determine the effect of income tax law on the behavior of operators in the sectors of production and distribution of food. Evaluation of effective tax rate helped to determine the effectiveness of diversity of enterprises in different sectors of the food economy in the optimization of the tax burden. Abstract The exemplary farm was analyzed in the paper, in order to assess if regulatory amendments in 2011 resulted in changes of VAT settlement schemes in agricultural holdings. The results show that in 2010 and 2011 the analyzed farm generates higher income using lump-sum tax. This is a result of farm’s spending structure, where basic means of production and services predominate. The situation might change if the farm started to invest, which would require purchasing goods with higher VAT rate. Abstract The paper concerns with a bank levy as an instrument of state regulation aimed at increasing the stability of the financial system. The analysis shows that in the case of Poland, an introduction of the bank levy at a rate of 0.39% of total assets would cause a significant rise in the tax burden on banks. According to our simulations, if the bank levy had been applied to the banks in the period 1999–2009, the total return on assets (ROA) and return on equity (ROE) would have gone down respectively by 0.39% and 5.90%. As a result, development of the banking sector, considered as a main driver of national economy, would have been slower. 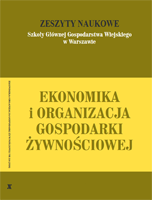 Abstract The aim of the paper is to define the level of fiscal burden in farms in relation european size and type of farming in Mazowsze and Podlasie region, in Poland and also in selected European Union countries. The period of farm investigation covers the years 2004–2008. On the basis of conducted research has been ascertained that farms which had lower economic power (ESU), had the highest level of fiscal burden. In addition, the type of farm – “milk” paid the lowest taxes in relation to their income. Thus, the tax system favors farms, where production is highly dependent on land and high economic strength. Abstract Expressing current problems of implementing is a purpose of the article accountings in agriculture. Findings were described conducted in an individual arable farms on the Lower Silesia. Keeping the accounts in the farming can be necessary in the prospect of introducing the income tax in the agriculture. The fact that farmers don’t notice the benefi t from keeping the accounts is the most considerable problem. They think that the bookkeeping is troublesome and timeconsuming not to say unnecessary. Not noticing the benefi t from the bookkeeping concerns smallholdings mainly. Consumed in fi eld farmers aren’t often a hard work to conduct getting up of additional documentation. Abstract Problems with financial liquidity are the main cause of bankruptcies of small and medium-sized enterprises in the short term. Financial liquidity is a priority element for a corporate finance manager should pay more attention when making current decisions. The specificity of the meat industry to a large extent is related to the management of net working capital. Identified and calculated the force and therefore a linear relationship between siz of NWC and financial liquidity justifies the need for proper selection of management strategies of net working capital in order to maintain liquidity at a desirable level. Abstract The aim of the paper is to present and compare different variants to choose the form of taxation of income earned by farmers in non-agricultural economic activity. Thanks of study case of selected farmer, it was shown measurable financial benefits that the farmer can obtain as taxpayer. It depends on the choice of the proper method of taxation of income. It is shown that the choice of optimal form of taxation is individual for every entrepreneur. It depends on the factors affecting the manner of calculating the tax. The study presents the opinions of 50 farmers from the Podlaskie voivoidship on experience related to conducting nonagricultural economic activities. The results of research, which show that respondents usually choice general principles of the tax scale. Respondents – mostly agricultural producers – decide on the selection of accounting for income taxes after receiving information from accounting office. Later this accounting office keep accounts for this farmers.